Lunaris Slots | Large reels, FREE spins & more! Looking for a unique slot game? 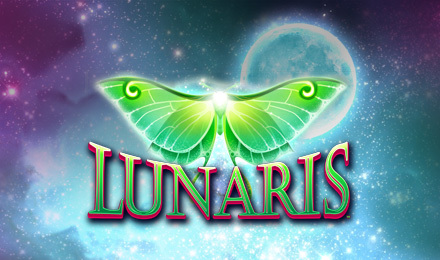 Try Lunaris Slots today! There are extra large reels, mysterious symbols and more! You're guaranteed a good time and some big wins. Lunaris Slots has a bit of a spooky theme and an extra slot game on the side with larger than usual reels. There are Wild symbols, FREE spins, multiplied wins and more! Lunaris has an intriguing Mystery Symbol, which will appear when the Moth appears on reels 1 and 3, and maybe 5 as well, where 5-20 mystery icons will show up across the reels. One symbol will be randomly chosen, and then the mystery icons will all become that symbol leading to mega wins! There are also FREE spins, which will be triggered when you spin 3 or more Caterpillars, rewarding you with up to 25 free spins.